Readers of my blog know that I have posted about peace monuments on the National Mall and around DC including the recently established Peace Trail on the National Mall (“Peace Trail on the National Mall, “ 3/3/17; “Explore Peace Monuments,” 1/5/17; “Peace Monuments Dedicated in 2015,” 1/4/16; “West End National Peace Monuments,” 6/22/14; “Visiting Washington DC This Summer? Visit a Peace Monument,” 5/30/14; “Gandhi Memorial and Other Embassy and Diplomatic Peace Monuments,” 7/25/14). 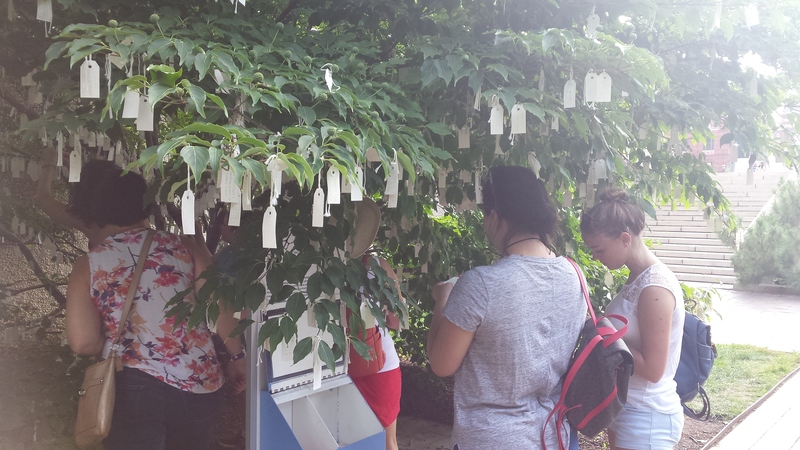 If you are in DC this summer, make sure to visit the Smithsonian’s Hirshhorn Sculpture Garden to see Yoko Ono’s “Wish Tree.” You can leave a wish on a tag on the tree and many are wishing for world peace! The Smithsonian’s Hirshhorn Museum and Sculpture Garden will open celebrated artist Yoko Ono’s interactive “Wish Tree for Washington, DC,” in time for the Independence Day weekend. While visitors are encouraged to whisper their wishes to the tree year-round, from July 1 through Labor Day, the Wish Tree will bloom with paper tags, as the artist invites museumgoers to write and hang written wishes from its branches.